Proudly give your homemade creations and best inventions the American Vintage seal of quality. This all-purpose style revives the earnest appeal of vintage apothecary bottle and jar labels. Hints of old-school handwriting are lightly visible behind a seemingly sun-streaked surface. Concentric circles graphically frame American Vintage, drawing attention to the most important part - your words! Prominent condensed bold text spotlights your name, product or event in the center while supporting text arcs around it. A bold vintage script accents the main font and gives you plenty of extra space for personalization and details. Available in ten richly shaded, deeply desaturated colors and nine vibrant brights designed to suit your homemade wine, beer, preserves - and much more. 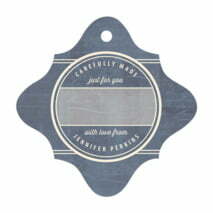 Customize your American Vintage writeable gift tags today! These American Vintage writeable tags for presents and gifts are printed on extra-thick cover weight white paper and come in two shapes. The American Vintage gift tags come pre-punched with a small round hole to thread your choice of tie material. They are punched out individually and packaged as a set in small bags. At Evermine, we've put a tremendous amount of thought into our packaging, material quality and lovingly created designs to make all your presents and gifts perfect. Have fun personalizing your American Vintage gift tags today!